Realizing and maximizing the benefits of an Oracle investment requires more than just technical prowess. It requires a comprehensive understanding of specific industry processes and challenges, developed through real-life experience. It calls for provocative, innovative creativity to unite technology and expertise in order to deliver the kind of impactful solutions that boost business competitiveness and revenue growth. An Oracle Platinum Partner, we help companies secure the maximum benefit from their IT investments. Rolta has a proven track record of leveraging Oracle solutions to deliver operational excellence, revenue growth and improved operating margins. The Ri3 Rolta Mission is our roadmap for client engagements. • Deliver valuable, industry-specific INSIGHTS. This is what makes us different and invaluable to our clients. • Develop INNOVATIVE solutions that dramatically improve business operations. • Achieve faster time-to-value for meaningful, measurable IMPACT to clients’ businesses. Rolta consultants bring much more than a deep understanding of the complex and integrated workings of Oracle applications. They have extensive backgrounds in the industries we serve, averaging 14 years of experience working in the industries we serve before joining the Rolta team. Rolta continually hones the skills of its teams and invests in providing domain-specific and technology training, leading to a constant build-up of expertise. 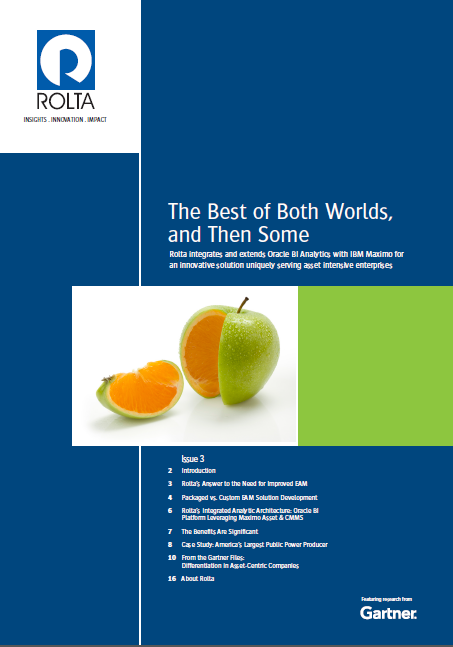 Innovative thinking and creating new solutions from existing information is ingrained in the people at Rolta. Proven methodologies, best practices and Business Accelerators are utilized to dramatically reduce implementation discovery, configuration, and testing time. The result is predictable and expedited access to proven solutions that minimize the risk of new technology adoption. To schedule a time to learn how to maximize your Oracle Applications investment, email us at Info.NA@rolta.com, or click here to request a meeting.